Jamie teaches guitar lessons in many styles: classical, jazz, blues, rock, folk, alternative, to name a few. He holds a B.A. from Hampshire College, where he studied classical guitar performance. 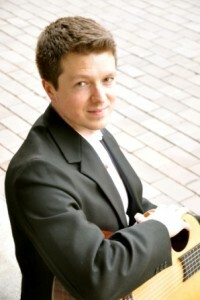 Jamie performs regularly with classical guitarist Joe Ricker as Duo Orfeo, and they have released three albums that can be purchased on their website, duoorfeo.com. Jamie also works as a classical guitar teacher at Soloman Schecter Day School.